Lady Of Ag | A little snapshot of the Caldwell's life on and off the farm. Those of you who know our family know how hard we are on one another; in a fun- loving way, of course! Here is a little example of just how extreme that can get: Our son, for years, told our daughter she wasn’t planned and we probably loved him more because we had to try for some time (like we were almost getting tired of each other) to get him. Kaydee full well knows how much we love her, but his comments were really starting to get in her head. Matt is incredibly clever and told her she could fire back at Emmet by letting him know he was the reason they didn’t have any more brothers or sisters. Mercy! Some people and families would take all of this WAY too seriously and genuinely hurt one another. Thankfully, it all really is in fun for us. Do you see the orneriness in that top picture??? And then they grow up some more. And they do things that we moms don’t think are safe. And hopefully they survive with nothing more than a few stitches or ankle braces needed, along with countless ice packs and bottles of stain remover. The last person a young man wants to disappoint is his mom. The first person a young man will go to when he is in real trouble is often his mom. Yes, us moms get stronger and stronger as we raise boys into men (and it sure does help to have an amazing husband to do this mom thing with – I am too lucky!). The dating challenges, the school frustrations, and eventually interviewing for career opportunities all get vetted not only by dads and best buddies, but us moms, too. So, Moms, tell them – tell them to do the right thing when no one is looking; tell them to put others ahead of themselves (they might already know this if they had show animals that ALWAYS came first); tell them to hold the door for a lady, not because she’s a lady, but because he needs to behave as a gentleman; tell them to send thank you’s and to call their grandparents regularly. Tell them you love them and you are proud of them and that you like it when they come lean on your shoulder while you are working in the kitchen. And for goodness sake, let yourself laugh with them. Perhaps I especially think about all of that this time of year, as we are coming up on the birthday of one very special Son was born to save us all. I cannot imagine the emotions Mary experienced! Good grief, I am a hot mess just praying our kids are happy and safe and carrying out their intended calling – nothing close to birthing a Savior! If you read the book of Luke, right away in chapter 2, as a 12 year old boy, Jesus gave his parents a scare when he stayed in Jerusalem rather than returning home with them. Boys have been ornery, whether intentional or not, FOREVER! 49 “Why were you searching for me?” he asked. “Didn’t you know I had to be in my Father’s house?”[f] 50 But they did not understand what he was saying to them. For all of you moms of young sons out there – enjoy it. It will be frustrating and scary and oh so much fun to raise them into young men. And I tell you, it’s worth it! Having adult kids is such a joy!!! The two young men in these pictures have been friends since first grade – and I am glad, because that gave us parents a chance to become friends, too! They have grown into wonderful young men who are respectful, polite, and quite handsome, if I do say so myself. Preheat oven to 350 degrees. Mix together all of the meatloaf ingredients and press into an 8/8 glass pan. Mix sauce ingredients and pour over raw meatloaf. Bake for 45 minutes or until done (internal temp should be at least 160 degrees). Double all ingredients for a 9×13 pan. We really like to pair this with baked potatoes and green bean casserole. Enjoy! You be you, my friend! But alas, you are the one doing all of those things listed above – the chores and harvest and meetings. And when you have sold the calf crop and the grain crop and you deposit the paycheck for the entire year’s worth of work, there is just enough to cover all the bills, and nothing left over for a nice vacation. That is when you get to make YOUR choice – you can be gloomy, comparing yourself to everyone you are not, or you can be thankful. I so hope you choose to be thankful. Those of us who get to farm and ranch get things others only dream of seeing on vacations. We get the most gorgeous sunsets, ever. And, we get to see them frequently because we are usually still out working, right??? A random October sunset at the Caldwell place. We get to enjoy wildlife as we go about our days. Others pay a lot of money to come to our part of the world to hunt and fish – we have it all right where we go about our daily tasks! This is my awesome niece with the nice buck she got this year. Every day can be a complete struggle or absolute joy for each and every person – for so many different reasons. Some years the vacations will happen. Some years the stay-cations will be what you get to enjoy. Family, friends and acquaintances will have something wonderful happen to them, while you do not. You will certainly hope they are there to help celebrate you when your turn comes – celebrate them when it’s their time! We are all here in this earthly world for a finite amount of time. Since you are reading this, you obviously woke up this morning to get to choose to enjoy another day. On this day, YOU DO YOU! Please, DO NOT compare yourself to anyone – they very likely are not even thinking about what you have or do or look like. But, they WILL notice if you smile, help someone out, or overcome a challenge. The only comparison you need to make is if you are a better version of you than you were last week or last year – you do you. That was the topic of the sermon at church last Sunday. It was a short sermon because it’s a pretty darn blunt message! Well, that, and our pastor is just really good at getting the point across in a short time with a LOT of enthusiasm! There are some awfully good tv shows and movies made about this very thing – trying to get along with neighbors; and for good reason! Your neighbor constantly spies on you and then reports to everyone else what they see you doing. First of all – how much fun is it to do things because you know they are watching!?! Do something to give them an extra good story, like writing Christmas cards during the summer or using a fork to eat ice cream (I may or may not do these things regardless if someone is watching). Then, each and every time you see them, kindly ask how they are doing and offer them a cookie – preferably a Valentine’s cookie at Easter, a Halloween cookie on Valentine’s Day, and a Christmas cookie on 4th of July. Just generally keep them guessing – cheap entertainment for you and them! I highly recommend a cookie/snack recipe I made this morning – your neighbor will LLLOOOVVVEEE you if you share! Peanut butter Fritos – oh my sweet, salty, crunchy, chewy deliciousness! Dump a bag of Fritos on a serving tray (I used a jelly roll pan covered with foil). Mix 1 cup sugar and 1 cup light corn syrup in a small sauce pan and bring to a boil – stir and boil just until sugar melts and mixture is clear. Remove from heat and stir in one cup peanut butter. Pour the entire mixture over the Fritos. Allow to cool and ENJOY! If your neighbor constantly has loud music going or loud machinery outside all the time, here is a potential solution: Give your neighbors a pair of Bluetooth speakers as a gift. How loving and kind is that? Then, you can use your device to blast music into the speakers at random times during the day so they can enjoy your music with you! You can easily sync your device to the speakers so long as you are not too far out of range. You can also blast creepy sounds to make them think their house is haunted, you know, just for fun. Your neighbor has all kinds of political campaign signs that you absolutely don’t agree with and they place them in their lawn right up to the very edge of the property line. This is NOT the end of the world! Once again, plan a bbq or meal, invite them to watch a ball game, and JUST DON’T TALK POLITICS. Honestly try to get to know something about your neighbor that has nothing to do with politics or even their habit that makes you angry. Do they love to cook? Are they good at art? Do they have an amazing garden? Did they grow up in a small town or a big city? Have they ever been to a farm? Do they enjoy sports? I know I am 100% chatty and I am also well aware of my tendency to hang with people that are just like me. That is when I remind myself, I am glad I have friends like Jonathon – not much like me, but SUPER cool and smart! I just have to be willing to show a little love to someone that at one time in my life I would have probably stared at, snuck a pic to send around to friends, and even sent a group “check this out!” text. That is rude and now I know I should talk to them instead of making fun…In fact, I got to enjoy a completely impromptu shopping trip at a thrift store with Jonathon! Here is my buddy Jonathan – he has more certifications and qualifications than I can name, he grew up in Hawaii and now lives in New York City, he is a great advocate for modern agriculture and I am proud to call him my neighbor from across the country! But in all seriousness – do you see why I would have sent that “check this out” pic!?!? Blue mo-hawk, a lot of crazy, and quite honestly, stuff you just don’t see much in good ol Clay County Nebraska, USA. Have a great week everyone – I hope you get to show some unexpected kindness to someone! Some pretty great memories are made on dirt roads! And, with that statement, I can guess where a few of your minds went – immediately to the slightly disappointing flavor experienced in sharing a can of beer that was snuck out of your parents’ garage fridge or to the stomach butterflies of fumbling through a first kiss, praying no one would drive by and see you. Yes, many of those growing up moments definitely happen on a dirt road (at least in our part of the world). Fast forward to the college years. It was on a dirt (maybe with a little rock or gravel) that Matt asked me to marry him. I’m not sure I could drive to the exact spot today, but I am comforted in knowing that he can and more importantly, that I said yes! Since we have had our own kids, they have also learned to appreciate the beauty of a good dirt road. (Okay, I’m not gonna lie – there are times, when we have had plenty of precipitation, that we really wish for a lot of rock and gravel on our dirt roads!) This picture of moving cattle along one of the roads we use often is so pretty! I will also confess, on that very road, in about that very spot, we had our pickup sliding sideways down the hill between the steep banks on either side, praying we wouldn’t slide all the way to the bridge and wreck, with two kids in car seats. I had sucked nearly all the air out of the cab, but Matt is a very good driver and had nerves of steel to steer us out of that scary predicament! But then again, that road served as a perfect backdrop to some of Emmet’s senior pictures. While a know full well how many great ideas are borne on the thinking throne, there are some pretty great dreaming sessions that happen on dirt roads. Whether walking, riding horses, driving ATV’s, or just cruising around in a pickup, there is something about a dirt road that spurs your ability to think beyond what is the here and now. We just need to take time to do it more often! With that, I hope you take time this weekend to enjoy a dirt road – wherever that is for you. We have still been cleaning up the Kottmeyer Place. Everything about it is an adventure. There are so many cool OLD things to wonder at! One of the things I wonder at is how many years worth of Old Granddad bottles are in one glass pile. That would be one of my less favorite drinks of choice, but based on the pile,there was a fair amount consumed on that place through the years – I’m sure, often times, with friends, telling stories. Roy Henry certainly knew how to tell a good story that never ended without belly laughs. Roy Henry ALWAYS had a dog with him! This is what good belly laughs look like!!! As we gather up piles of iron, wood, glass and so on, it’s easy to imagine what farming was like 100 years ago. I have stories from my grandparents to help solidify the images of smaller fields, larger gardens, horse-drawn equipment, early tractors, and of course, the old outhouse! Gosh – that is one thing that proves to me that God knew the right era to put me in. I am game to be one with nature if necessary, but to run out to an outhouse through a blizzard – I just don’t know if I’m that tough! From our grandparents’ stories, we know exactly how much change they got to see in their lifetimes. They did go from horse-drawn equipment to tractors with cabs. They went from thrashing crews to combines with air conditioners and bin monitors. They used crank telephones and ended up having cell phones. They celebrated yields of 60 bushel per acre corn long before they were disappointed with 100 bushel per acre corn. They got to experience so much advancement in their lifetimes! I have reached an age where I am old enough to love myself (that means I am way past my 20’s and beyond my 30’s). I think about what farming was like for my family when I was a kid and I wonder what is yet to come in the next 50 years. I know it will be nothing short of amazing! We already have driver-less tractors – well, WE don’t have that, but they have been created. We do have a drone at our place that gets used to check on where cattle are, look at pasture or crop quality, and so on. Seed genetics and soil health have improved immensely. And livestock – we have much better facilities, genomic data, carcass usage, and ultimately, eating satisfaction. Heck, we can even Ask Chuck how to prepare a cut of beef! It’s hard to believe we can get EVEN better at what we all do, but there are a lot of very bright minds working to help us do just that. I hope that as we continue to make advancements, we do so wisely. Every choice should leave our land, water, and air in better condition than when we became the manager of it. I treasure this line that I saw in an essay contest written by a young lady named Grace: “Honoring tradition and being bound by it are two different things.” May we always honor the important traditions of our families and our communities. May we also embrace and implement advancements in technology, farming practices, and food production while honoring those important traditions. Just for fun and because I love it, even though the ONLY thing about it that ties together with this blog is tradition, i.e. the father-daughter dance, here is one of my favorite pictures from the summer. And yes, she chose a dress with a very long, gorgeous train that was a beast to bustle up! I hope that a hundred years from now fathers are still dancing with their daughters. We have been getting rain – lots and lots of rain!!! We would have given anything to have received this rain back in May and June and July. I won’t be a whiner – I really am thankful for the moisture now, and I do realize it really is a blessing, but golly, it would be nice for the crops to get harvested. And to have the cattle pens not be muddy. And to have the gravel roads not be a muddy disaster. Okay – sorry, I did whine there just a little bit. Yes, this rain is a blessing, it doesn’t seem like that many years ago we had a very dry fall with strong winds and combines and fields were catching on fire all over the place. We will gladly deal with a little mud. I really love riding with Matt in the combine. And we will sit until it gets dry again. Sometimes things do happen just at the right time. Last summer we were literally 24 hours from having to drive an hour one way to pick up a water trailer, drive another 20 minutes to load the trailer with water, and then back to the pasture and home again – all for one of the pastures of cows to have water to drink. Their pond was down to the tiniest muddy water hole you can imagine. We also had a list of cows we were willing to sell because we just weren’t going to have enough grass to get them all through the summer. Amazingly, we received enough rain to fill that pond the very next day. And since then we have received enough rain to keep the grass going. God is good! That was a very timely blessing! These little corn plants ended up getting just enough rain to make a nice crop. How many times in life do we think, “if this had only happened then, not now?” Or even more often, how often to we receive or encounter something that we wish would never happen at all? There are always struggles, whether they are with health or finances, or for farmers, the weather; and sometimes they are with friends or family relationships. Our pastor reminded us last Sunday (yes, it was raining then, too), it will be o.k. It always ends up being o.k. It may not be exactly as you planned and it may stretch your faith and make you get out your thinking cap, but it will be o.k. This is the rain that came just in time last summer – it was a million dollar rain for the area. I feel like I need to share some comfort food after all of this. Since it’s been damp and chilly, we have already kicked off soup season at our house. 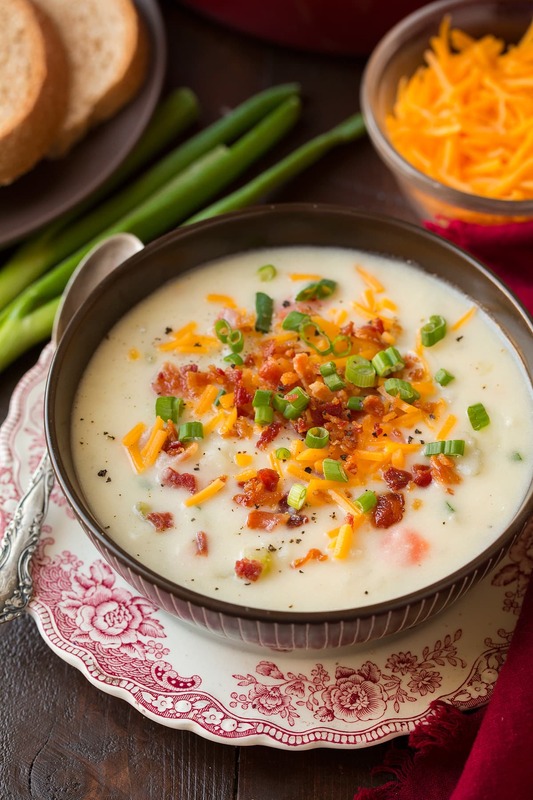 Here is a recipe link for a DELICIOUS potato soup we just had. Matt and I both highly recommend it (especially with plenty of bacon)! P.S. I know I have been VERY VERY bad about blogging the past couple (er, maybe 3) years. I have committed to myself to get back to it. If anyone reads these posts, push me – make me be better about blogging and I certainly welcome topic ideas!